The two tunnels from the Cavendish cutting were complete by mid-1829 and their owner, the Liverpool & Manchester Railway Company, decided to open them to public viewing for a small fee. Three sessions were arranged on Fridays in late July/mid-August so it appears that there was significant interest. The tunnels were whitewashed and lit by gas, the number of lights being doubled by the time of the third viewing. According to the advert in the Liverpool Mercury for the third and final "exhibition", visitors were charged a shilling (accompanied children free) and could access the tunnels either via the company premises at Wapping (the goods station) or at Crown Street where access was via the archway. What little we know of the appearance of the Liverpool Crown Street station comes from early railway artists Thomas Talbot Bury and Isaac Shaw who both present roughly the same view of the station building and train shed looking east towards the little tunnel. On opening there was no train shed, confirming that both pictures date to 1831 (the shed is unfinished in the earliest variant of Bury's print). Other published images are from the same perspective. We know from maps, however, that there was an entrance building as well other structures behind the station. We now know there was also an archway. 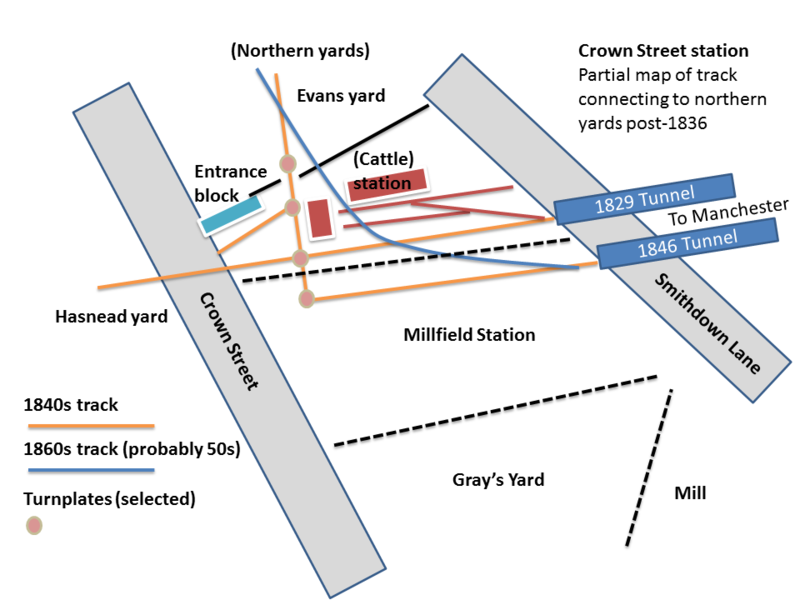 In 1829 there were few, if any, buildings on Crown Street apart from the station. There were, however, two entrances to the yards south of the station. The yards were largely hidden from passenger view by the screen wall supporting the train shed (there may also have been iron pillars beyond the wall). An arch may therefore have been used to draw attention uniquely to the passenger entrance. Entrance arches would subsequently become iconic railway structures for large stations and especially termini. Though not strictly an arch, Hardwick's Euston Arch for the L&BR is the archetype but in Liverpool the gates to the 1836 Lime Street station were positioned in the roman arches of Foster's facade a year before Euston opened. Another possibility, of course, is that the arch referred to in the advert was the tunnel portal where the underground visit would necessarily commence. This, however, was offset some distance from Crown Street and probably not visible from the street given the high walls likely surrounding the station yard. 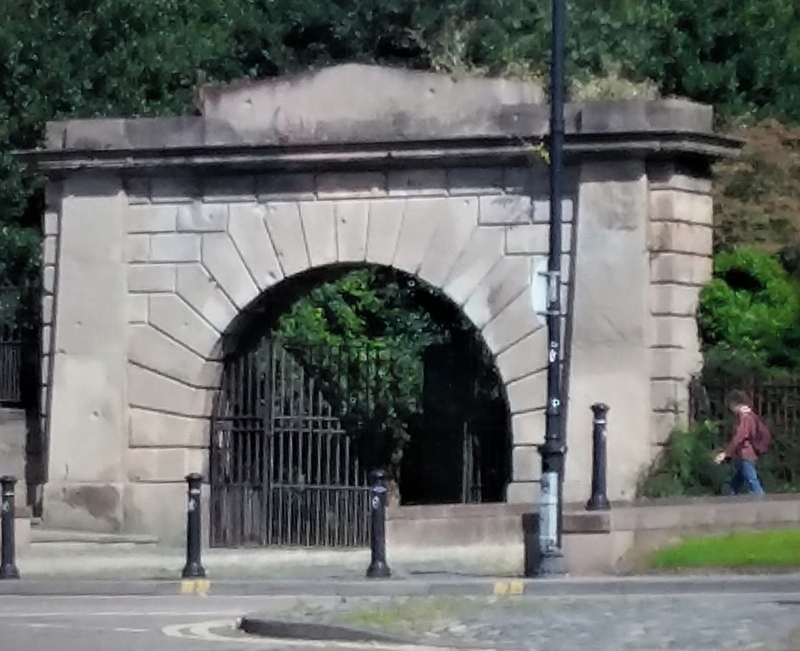 A final possibility is that the arch refers to the so-called Moorish Arch that Foster designed to act as a gateway as well as hiding the engine houses either side of the Cavendish cutting. However, this was even less accessible than the tunnel portal and permission was only given for construction to start on 28th June 1830. As Isaac Shaw's famous print shows, the arch was still incomplete when the railway opened on 15th September 1830. It is possible that the entrance arch was a temporary wooden structure for the viewings but the need to distinguish the passenger entrance would be enduring so I think this is unlikely. An arch at the Crown Street entrance would also have given the station a little extra refinement and it is tempting to suppose that it resembled similar structures at nearby country estates. Its height and width would allow safe passage of a horse-drawn omnibus from the coaching office in Dale Street. 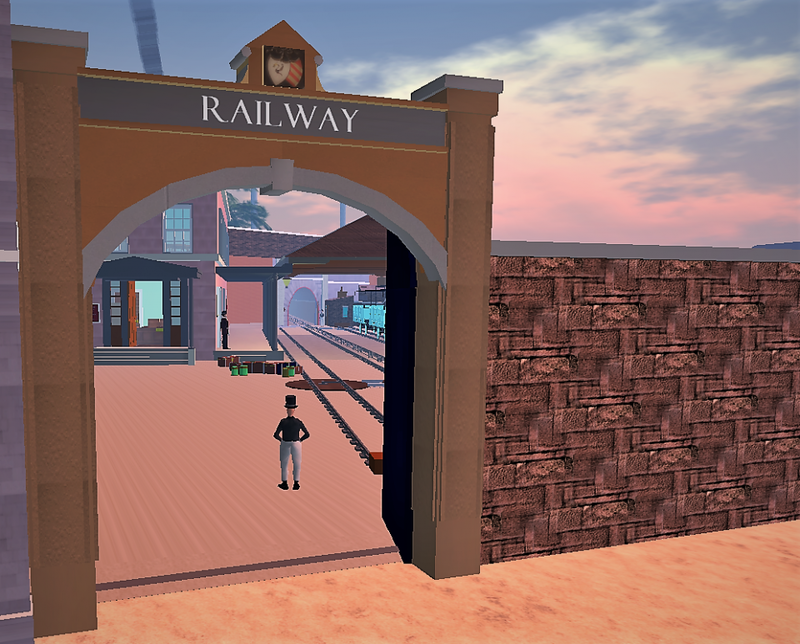 The actual form and composition of the archway is unknown so the present structure in OpenSim is simply a placeholder as is the adjacent entrance block. Was the archway made of stone or brick or perhaps a combination with a metal or wood arch on stone pillars? Pillars without arches are seen at later entrances to two yards north of the passenger station which survive to the present day. In the absence of more detailed plans or images, we can only guess how the archway might have appeared. It seems unlikely that it was architecturally remarkable as it was sited in a cramped space. Among contemporary work by architects associated with the station, Foster's south entrance to St James's cemetery (opened 1829) is distinctive but surely something like that, or indeed something moorish, would have been noted by the press and travellers. It would also be at odds stylistically with the station building beyond. 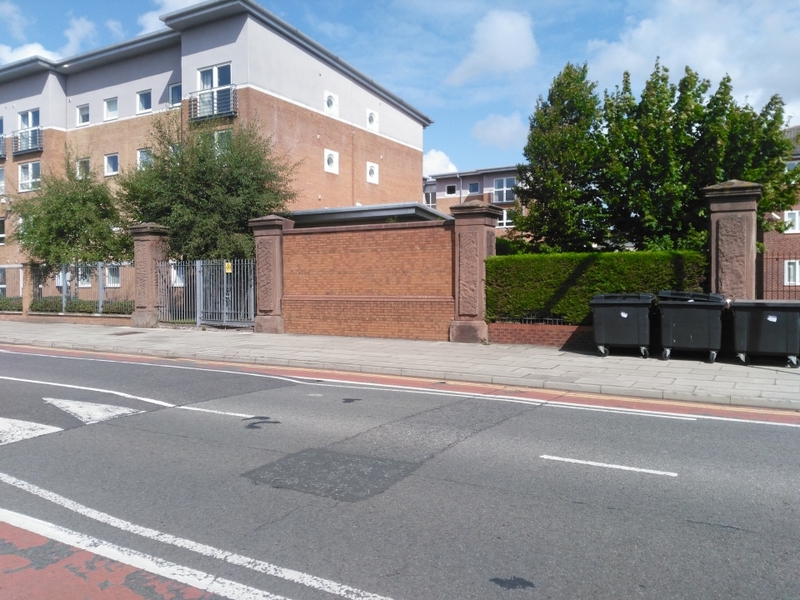 Fig: Foster's gate to St James's Cemetery, Liverpool. In the OpenSim build it is used as a surrogate for the portal of the little (Stephenson) tunnel. The OpenSim build envisages a simple arch with supporting stone pillars. As with the later Lime Street facade, the company crest is on the top and the word RAILWAY is engraved on the stone. Of course, it may have been RAILWAY STATION or LIVERPOOL CROWN STREET or some combination thereof (or none at all) but a simpler term may have sufficed under the peculiar pioneering circumstances. The nature of the gates under the arch, if any, is necessarily uncertain. As at Lime Street, wooden hinged gates are perhaps a more natural complement to an arch but would occlude part of the entrance block when open. Ironwork (as at the cemetery) would be an alternative. Hulton's coalyard on Crown Street had a sliding gate with embedded pedestrian entrance. The gate was actually external to the yard which would spoil the appearance of the station entrance. What became of the archway? 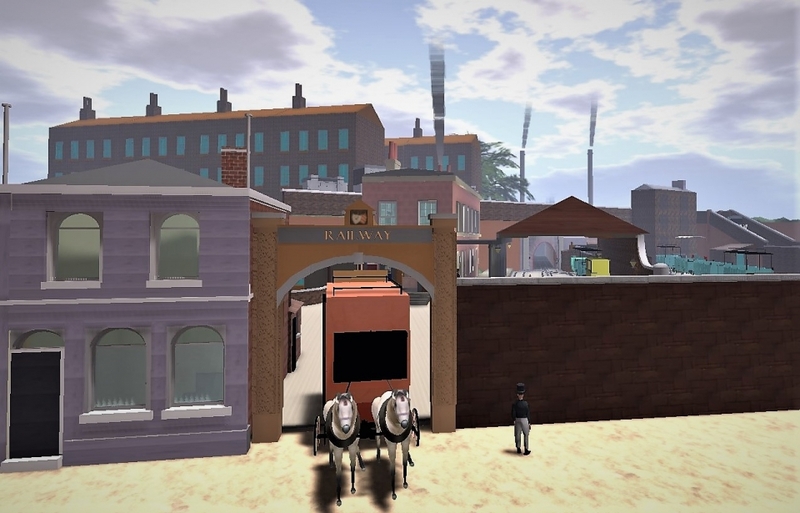 It appears that passengers to the first proper railway station entered via an archway opening into a yard. The purpose of the archway may have been both aesthetic and navigational. 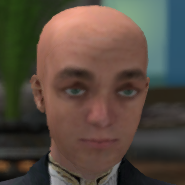 Judged by my amateur efforts with OpenSim, the arch would have given the entrance a degree of gravitas appropriate to the country-house ambience of the station building itself. Its absence from artwork of the period may reflect a degree of artistic control exercised by the railway company but plausibly also constraints on perspective if the station is viewed through the arch. Once Lime Street station opened the station building at Crown Street appears to have been largely demolished with remnants reused for loading pigs and cattle into wagons for shipment to Manchester. How long the arch survived is unclear. With the advent of the 1846 tunnel to the Cavendish cutting, coal wagons could go directly into the northern coalyards without the use of turnplates. Ultimately track also crossed the street immediately adjacent to the archway which may have been demolished at that stage if not earlier. There is no sign of it in the panoramic view of Liverpool published by Ackerman in 1847. However, I suspect the view is necessarily somewhat simplified when it comes to the station area. The only relic of the original yard that L&NWR Northern Goods Manager Braithwaite Poole considers retaining in the 1849 "push for coal" report is the "obelisk", presumably the tall, exotically shaped chimney towards the south of the station seen in the panoramic view and Herdman's painting of Smithdown Lane. There was no archway at Manchester but the situation there was very different, the under-stated two-storey departure station being an answer to the elevated track crossing the Irwell and entering the station on a (largely hidden) viaduct in close proximity to the street. Of course, for travellers there was nothing new in accessing transport via an archway. Inns had long served as stations for stagecoach travel and the coach frequently started from a courtyard accessed from the street via an arch of sorts, generally integrated into the building. Inns also served as coaching offices on the Stockton & Darlington Railway. Arches were a prominent feature of the facade of the original Lime Street station, both for decoration and for entry to the station beyond. The grandeur of the early mainline termini may owe much to the collective aspirations of directors and corporations but, as pointed out by Meeks, the important components were already present at Crown Street, including, most likely, a subdued but decorative archway entrance. Fig: Was the archway omitted from pictures because it limited the view of the trainshed?